Gloria Swanson was born Gloria May Josephine Svensson on March 27, 1899 to Joseph Svensson and Adelaide Klanowski in the Lake View district of Chicago. Her father was employed by the U.S. Army transport service so the family moved frequently during her childhood. They lived in Key West, Florida and San Juan, Puerto Rico for several years. 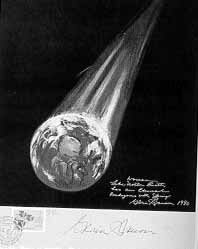 Eventually, Gloria and her mother would return to Chicago while her father remained stationed oversees. Gloria was a beautiful and talented child and her mother was constantly making her beautiful clothes. 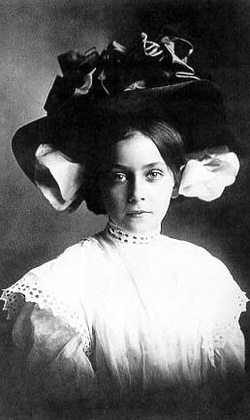 Her mother worried that her ears were too large and she was always making her special muffs and hats to hide them (note the photograph). During her school years, Gloria loved to perform and she acted in a number of school plays and was the star of an operetta while in Puerto Rico. She possessed a lovely singing voice and she decided that she wanted to be an opera singer. Gloria was 15 and she and her mother had moved back to Chicago when Gloria's aunt suggested that they make a trip to Essanay Studios. Essanay was a film studio in Chicago which also had studios in California. Gloria was immediately fascinated with filmmaking but she thought that movies themselves were crude and vulgar (the most famous films at the time were slapstick comedies). Before she knew it, Gloria had requested a bit part in a film and her good looks and stylish clothes got her the attention of Essanay directors. The money was good and the work was not that bad, so Gloria continued to accept jobs at Essanay. It was a good way to earn extra money for her favorite past-time - buying clothes! Swanson continued to make two reelers for Essanay and it was there that she met Wallace Beery, who would become her first husband and persuade her to move to Hollywood. Gloria found filmmaking in Hollywood to be more rewarding than it had been in Chicago and she began to take a keen interest in acting as a career. She gained modest success when Mack Sennett teamed her with Bobby Vernon in a series of films together. Gloria longed to do serious dramas, however, and she came to despise the Sennett comedies and felt that they were tasteless. Her chance to escape Sennett came when the Keystone Studios went bankrupt. Although Sennett wanted to retain Swanson and turn her into a second Mabel Normand, Swanson balked and Sennett tore up her contract. Following her fallout with Sennett, Swanson migrated to Triangle Studios. The executives decided at the very beginning to build Swanson up to star status. They gave the best production values thatthey could for her first Triangle film, You Can't Believe Everything and Gloria clicked with director Jack Conway. Things eventually did not turn out like she thought they would. Conway left Triangle because of creative differences and Swanson found that her scripts kept getting worse with each new project. Soon it seemed that most of her features were spy melodramas such as Secret Code. After eight mediocre films with Triangle, Swanson was released from her contract because the studio was facing bankruptcy. Luckily for Swanson, one of the greatest Hollywood directors had his eye on her. Cecil B. De Mille, master of the bedroom drama, had noticed Swanson's potential years earlier in a Mack Sennett comedy. Beginning with "Don't Change Your Husband", De Mille transformed Swanson into a glamorous clothes horse who became the envy of women all across America. 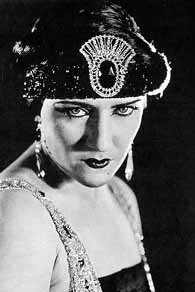 De Mille's films were expensively mounted soap operas in which his heroines were draped in outlandish costumes and jewelry and indulged themselves in queenly bathing rituals. Also typical would be a sequence in which the characters would be portrayed in another era, thus giving the opportunity for even more elaborate costumes. Swanson made six films with De Mille and it was a very happy and satisfying time in her career. De Mille's films catapulted Swanson into superstar status. Her every move was followed and reported by fan magazines. They expected to see her dressed to the hilt in the latest fashions and Swanson never disappointed them. Her producers soon learned (after her drab attire in Under The Lash) that she must wear lavish clothes in her films or her films would not be successful. In her private life, she bought a fabulous mansion and lived like a queen. 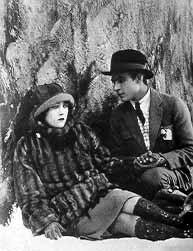 with Rudolph Valentino in "Beyond the Rocks"
Swanson was the queen of Paramount Studios and her ilms were getting better and better. She was paired opposite Rudolph Valentino in Beyond The Rocks which was very successful. She also met director Allan Dwan and made some of her best silent films with him (like Manhandled). These films gave her enough clout to work with Dwan in New York at the Astoria Studios where the atmosphere was more productive to her. In late 1924, Swanson obtained the rights to a French play called Madame Sans Gene and remarkably for the time, she also received permission to film in France. It was during the filming that she met her third husband, the Marquis Henri de la Falaise de Coudraye. Her return to American with her new husband was no less than sensational with thousands of cheering fans lining the streets. Swanson and her Marquis made a cross country train trip to Hollywood from New York and every stop was heralded as a major publicity coup. Her career with Paramount continued to flourish but she was soon tempted with an opportunity to produce her own films and have them released through United Artists. Many of Hollywood's greatest actors at the time, such as Mary Pickford and Charlie Chaplin, were doing this with great success. Swanson was attracted to the idea of only making one or two films per year as well as having total creative control over them. So, despite a huge pay raise promise from Paramount, Swanson chose to go out on her own. She chose to remake a 1919 Clara Kimball Young film, Eyes of Youth (retitled The Love of Sunya) for her first independent production. She was soon cursing herself, however, for turning down a tremendous salary along with the security of a studio to deal with the hassles and the headaches of producing. The Love of Sunya was not a financial success. Her second production, Sadie Thompson, fared much better but she had an uphill battle with the Hays Office regarding censorship problems. The film paid off in the end with Swanson garnering her first Academy Award nomination. In 1928, Swanson, with her lover Joe Kennedy (father of John F. Kennedy), teamed with Erich Von Stroheim for Queen Kelly, a project that would never be completed. Von Stroheim's excesses in filmmaking were legendary in Hollywood but he had many masterpieces to his credit, among them Greed (1924). His meticulous attention to detail and endless retakes put the production way behind schedule and Swanson herself finally halted the production. Decades later, the unfinished film was botched together with production stills and photographs and declared a masterpiece by film critics. Swanson was not one to be done in by one bad experience and she immediately began work on her first sound film called The Trespasser. It was a great success and audiences were happy to hear that Gloria could not only talk but sing as well. She secured a contract with MGM but unfortunately her follow up films did not fare as well as The Trespasser. Her decade of splendor had ended with the depression era audiences and her films were simply out of sync with the public. After the failure of Music In The Air in 1934, she went into semi-retirement. A comeback attempt was made in 1941 when she was offered a comedy called Father Takes A Wife. It was not a success but Gloria Swanson's film career was not over just yet. Almost ten years following her last film, Swanson would make the most memorable comeback in film history. The role of Norma Desmond in Sunset Boulevard had been turned down by Mae West but Gloria snatched it up. Her portrayal of a faded silent screen film star who imagines a glorious comeback was inevitably compared with Swanson herself, but it was to be a portrayal that would be forever remembered by film audiences. Despite giving one of the greatest performances in film history, Swanson's film career did not progress much further. A forgettable comedy, Three For Bedroom C, followed Sunset Boulevard but failed at the box office. An Italian film, Nero's Mistresses, was made three years later but was so bad that it was not released to American audiences until seven years later. Swanson did not return to the screen until the 1970's when she made a memorable television film called Killer Bees and played herself in the disaster epic Airport 75. 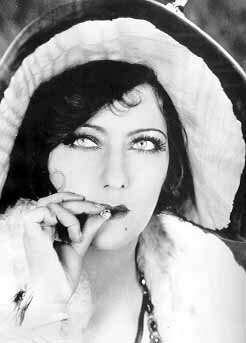 Gloria Swanson was a fascinating woman whose talents went beyond film acting. She had an instinctive curiosity and was always exploring new interests. Her childhood dream of becoming of opera singer would probably have come true if she put her mind to it! Her lifelong interest in nutrition and the body began in her early years when she was introduced to Dr. Henry G. Bieler who explained to her how the body reacts to foods and the harmful effects of certain foods. It was not a commonly heard theory in those days but Gloria was interested and thus began her lifelong interest in foods and the body. She later believed that food was not only a food source but a viable part of skin care. She once commented that most of her groceries went on her face instead of her mouth. 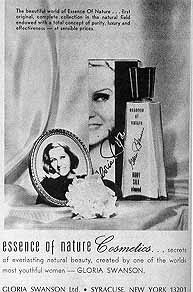 She established a line of cosmetics in the 1950's that only used natural ingredients. Gloria was a woman know for her fashion sense and in the early 1950's she put it to use. She worked for a clothing line called Forever Young for ten years and traveled across America talking with salesgirls and department store owners about women's clothing. She suggested changes in how the clothes were being made and her ideas helped the company's profits multiply considerably. One of Gloria's more interesting endeavors came in the late 1930's when she came up with an idea of bringing foreign inventors to the United States (many were attempting to flee the war anyway) and giving them a safe haven and environment to develop their ideas. The company was called Multiprises and was successful for a decade. In the 1970's, Gloria discovered her artistic abilities. She began sculpting and was offered a one woman show. As a result,the United Nations Decade For Women asked her to design a poster and stamp for an exhibition. The stamp, depicting the earth with an embryo etched in the outlines of the continents, contained the caption "Woman, Like Earth, Has an Eternal Rendezvous with Spring". The pieces are collector's items today. Perhaps Gloria's greatest non-film achievement was her writing ability. In 1980, she published her autobiography titled "Swanson On Swanon". The book is a very well written account of her life which touches on the ups and downs of her glorious film career as well as personal torments in her private life (she writes honestly about an abortion she had in 1924 and how the decision forever affected her life). The book was a great success and widely praised. Gloria Swanson died in her sleep on April 4, 1983 of a heart attack. She was 84. She is buried in New York City at the Church of Heavenly Rest.